Is Medtronic's HeartWare a Problem? A month after acquiring the LVAD maker for $1.1 billion, Medtronic says FDA has designated two of its recalls as Class I.
Medtronic says it is making some important manufacturing changes at recently acquired HeartWare amid two recalls that FDA has designated as Class I, the company announced Friday. One worldwide recall initially involved 8799 HVAD controllers--model Nos. 1400 and 1401. The controllers were potentially damaged from exposure to moisture through loose power and data connectors, and hospital clinicians' subsequent inspections have resulted in 308 replacements as of September 26, according to Medtronic. The second recall involved 350 unimplanted HVAD pump implant kits--model numbers 1103 and 1104, with serial numbers lower than HW25838--that were sitting in hospital inventory. The pumps in the kits are potentially susceptible to electrical faults and connection failures from fluid entering the driveline-to-controller connector, which could then result in a potentially fatal pump stop. Most of the implant kits, 92%, had been returned as of September 26. One patient death reported earlier this year could possibly have been related to one of the controllers involved in the recalls, company spokesman Chris Garland tells Qmed. Learn about "How to Set Your Connected Health Solution Apart" at BIOMEDevice San Jose, December 7-8. Both recalls were started prior to Medtronic's acquisition of HeartWare, Garland said. HeartWare sent out a safety notification letter to hospitals around the world between April and June, informing physicians of the potential damage to controllers from exposure to moisture through loose power and data connectors. The letter advised hospital clinicians to inspect patients' HeartWare HVAD controllers for loose connectors at patients' regularly scheduled appointments, and it suggested that clinicians return affected controllers to the company for a replacement at the clinicians' discretion. Clinicians receiving this letter were also advised to remind patients about the safe use of ventricular-assist devices, particularly when it comes to moisture and proper connection to power and data sources, according to Medtronic. Damage to the controllers from moisture or faulty connections could cause loss of communication between the controller and monitor, a reduced ability to detect alarms, or interruption of circulatory support due to pump stoppage, which could lead to serious injury or death. HeartWare announced the recall of the implant kits in August. Medtronic's Garland says no deaths have been reported in connection with the implant kits recall. To fix problems going forward, the epoxy application to the driveline connector of the devices was changed "to reduce the potential for contaminants to enter into the connector to the driveline," Garland said. Prior to the two HVAD-related recalls mentioned here, HeartWare issued one in January of this year involving some of its LVAD batteries. (FDA announced the recall months later, in June.) The batteries had the potential to lose power prematurely due to faulty cells, according to the notice from FDA, which designated that particular recall Class I as well. 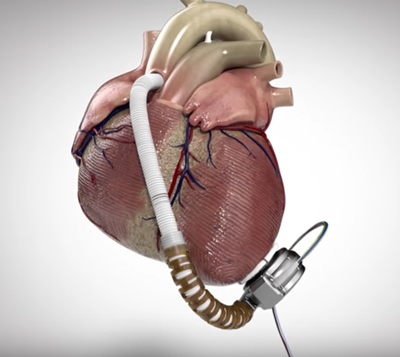 Medtronic acquired HeartWare for $1.1 billion in August. St. Jude Medical, which itself is in the process of being acquired by Abbott Labs, bought another major LVAD maker, Thoratec, for $3.3 billion in October 2015.